2014-2015: Our 150th Anniversary Year! For details of Services, please visit the Services page. Holy Saviour Church presents In The Mood … a Gala Evening of Music from Folk to Swing and beyond. Come and enjoy the Holy Saviour Choir, The Radcliffe Singers, and The Gainsford Swing Band, directed by Trevor Hughes, with guest artist Mark Adams and popular TV presenter Pam Rhodes. 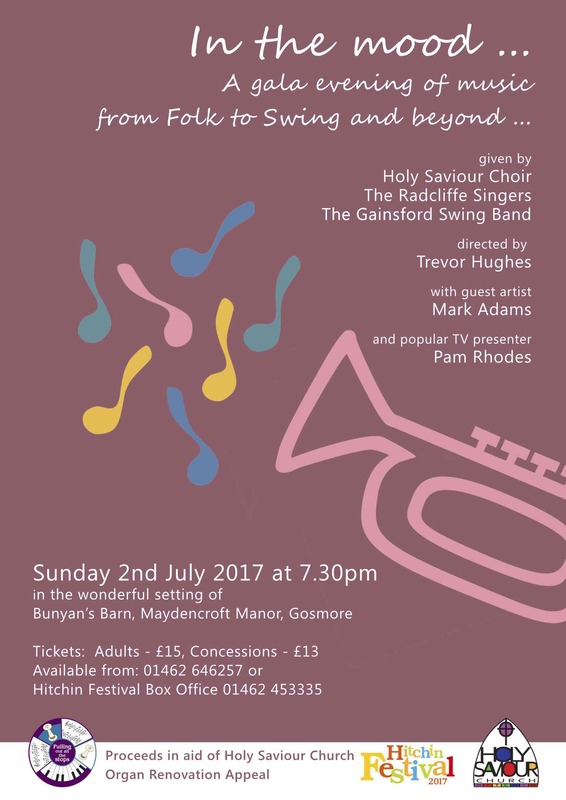 The concert takes place on Sunday 2 July at 7.30 pm in the wonderful setting of Bunyan’s Barn, Maydencroft Manor, Gosmore. Tickets: Adults £15; Concessions £13; available from Clare Fleck 01462 646257 or Hitchin Festival Box Office 01462 453335. Proceeds in aid of the Holy Saviour Church Organ Renovation Appeal.